From as little as $299. Not only are charges tracked but also payments. Want to know which customers still owe money? It's just one click away. 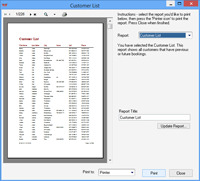 You can also export your customer's accounts to standard files, allowing you to use other systems such as MS Excel, or an accounting package. Without the need for an expensive Customer Relationship Management (CRM) program, iMagic Hotel Reservation turns your client database into a valuable marketing tool. It's easy to create personalized letters and mail merge them into your favorite word processor or e-mail program. Send special offers to your customers! Installation is quick and easy. Once you use the Configuration Wizard to get started, you can begin taking reservations immediately. Our unique Configuration Wizard asks simple questions to get you up and running. Then when you're ready you can configure more features as you need them. Hotel software that really is easy to use! Share your database across your network. iMagic Hotel Reservation has full network support, allowing you to have access to your bookings and customers any place - anytime. Manage bookings and create new bookings from your front and back office. If you have Windows XP or above you can even create a Virtual Private Network (VPN) and share the system remotely over the internet, giving you full remote management. Some of our top class reviews include perfect scores from - 5/5 UK Wares, 5/5 Brother Soft, 5/5 Sofotex and 5/5 File Transit. Whether you're a motel owner who needs to automate the reservation process, a bed and breakfast proprietor who wants to get out from under the paperwork of a manual tracking system, or a marketer who needs to turn guest history into additional sales, iMagic Hotel Reservation has the tools that you need. At last hotel software with no rental fees, at an affordable price, that's easy to use! Buy now from just $299 or download a free 10 use trial version and see for yourself today! All of our hotel reservation software and reservation software runs on Windows XP, Windows Vista, Windows 7, Windows 8 and Windows 10.